A 50-year-male presented with persistent, progressive shortness of breath for last 1 year along with swelling of abdomen for last 1 month. Physical examination revealed increased jugular venous pressure (14 cm of water), ascites along with presence of Kussmaul sign and pericardial knock. Clinically, a diagnosis of constrictive pericarditis (CP) was made. He denied any past history of tuberculosis or any other infective etiology. Past medical history revealed history of trauma in past childhood. Chest X-ray revealed a predominant circumferential calcification along the left border of the heart [Figure 1]. Doppler echocardiography showed evidence of CP with thick calcified pericardium. End diastolic pressure of all four chambers was also found to be equal. A diagnosis of CP due to trauma was made. Pericardial calcification is usually preceded by pericarditis or trauma. The most common causes of pericardial calcification are chronic idiopathic pericarditis, post-cardiac surgery, mediastinal irradiation, and tuberculous pericarditis. Both blunt and penetrating trauma rarely can result in pericardial calcification through activation of inflammatory and immunogenic phenomenon. Symptoms occurring after blunt trauma chest may be nonspecific. But it was rare for a patient with pericardial calcification to be asymptomatic for so many years after trauma. In a recent study of 135 patients with CP, pericardial calcification was seen in 27% of patients and the cause of CP was indeterminate in 67% of patients with pericardial calcification on chest radiography. 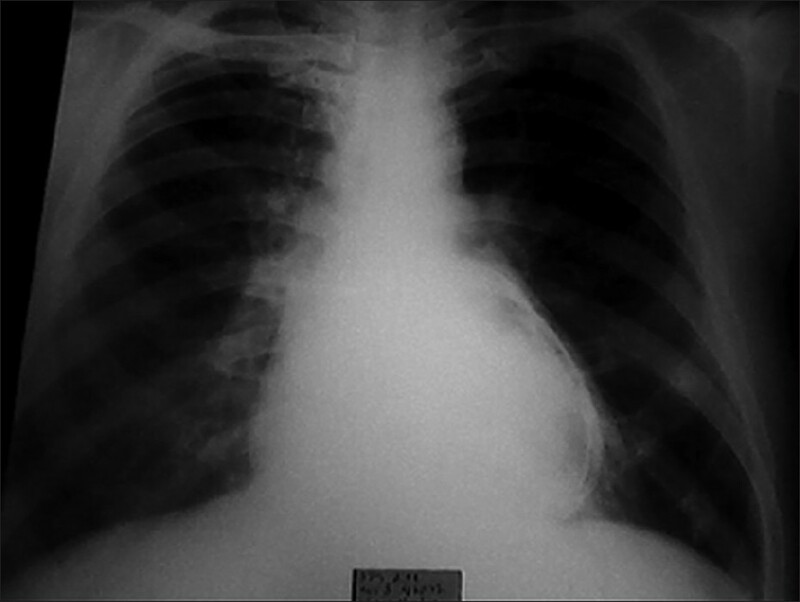 Dystrophic calcification usually indicates the injury to be more severe than pericardial healing without calcification. The site of maximal pericardial calcification occurs predominantly over the right atrium and anterior right ventricle, diaphragmatic surface, aterioventricular grooves, and rarely over the left ventricular apex. Right side of the heart is the preferential site for gravitation of fluid, where calcium and even bone are slowly deposited in the inspissated fluid. In this figure, calcification was predominant over the left side of the heart without involving right side. In short, it was a case of CP showing pericardial calcification following a history of childhood trauma. The pericardial calcification was highly atypical involving only left side of the heart sparing right side. 1. Bertog SC, Thambidorai SK, Parakh K, Schoenhagen P, Ozduram V, Houghtaling PL, et al. Constrictive pericarditis: Aetiology and cause-specific survival after pericardiectomy. J Am Coll Cardiol 2004;43:1445-52. 2. Lieng HL, Jae KO, Jerome FB, Hartzell VS, Gordon KD, Douglas WM, et al. Calcific constrictive pericarditis: Is it still with us? Ann Intern Med 2000;132:444-50.